Gregg Miller brings a rare mix of broad real estate transactional experience and extensive land use experience to the matters he handles. It is not uncommon for Gregg to represent clients in capital transactions – acquisitions, dispositions and financings – worth hundreds of millions of dollars, while also helping clients navigate the complexities of land use approvals. In many cases, this mixture of skills allows Gregg to handle a project from acquisition of the land, through entitlement, construction, lease-up, and sale. In addition, the experience that Gregg has obtained from handling transactional and land use matters is invaluable in public-private partnership deals that frequently require significant transactional skills and the ability to assist with obtaining land use approvals. Gregg also has experience representing lenders and borrowers in complex work-outs on troubled assets. 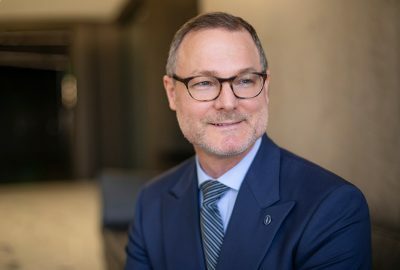 Gregg is a member of the San Francisco Planning and Urban Association (SPUR), the Urban Land Institute (ULI), the Real Property Section of the San Francisco Bar Association, and the University of San Francisco Law Review. He is also a graduate of the 2009 class of Leadership San Francisco (LSF), a ten-month leadership program that is connected with the San Francisco Chamber of Commerce. The LSF program focuses on educating and developing community trustees who want to make a significant contribution to strengthen and transform San Francisco. Gregg is president of the board of directors of Community Housing Partnership and also sits on the board of Lone Mountain Children’s Center. Gregg earned his J.D. from the University of San Francisco School of Law in 1998, and his B.A. from Yale University in 1992. Member of the Coblentz team that represents an affiliate of the San Francisco Giants in the Mission Rock project, a public-private partnership with the Port of San Francisco for the redevelopment of an approximately 30-acre site south of the ballpark. Represented the owner of a large apartment complex in a novel agreement with the City of San Francisco to preserve certain units at below market rate rentals following the expiration of 30-year tax credit bonds on the project. Represented clients in the negotiation of Development Agreements with the City of San Francisco with respect to various land use projects. Represents a developer in the entitlement of an 11-acre parcel in the northwestern portion of San Francisco for approximately 1.3 million square feet of residential, retail and office uses. Part of a team of Coblentz lawyers that assisted a developer with obtaining approvals for a mixed-use project consisting of approximately 600 residential units and retail space in San Francisco’s Market-Octavia neighborhood. Obtained approvals for an approximately 130,000 sq.ft. mixed-use project in San Francisco consisting of light industrial and office uses. The project was approved under a unique provision in the Planning Code that allowed re-development of underutilized sites for a mix of office and light industrial uses in a part of San Francisco where office uses are otherwise prohibited. Obtained approvals for the expansion of a private school from approximately 35,000 sq.ft. to 80,000 sq.ft. in San Francisco’s SOMA neighborhood. Obtained approvals for the expansion of a back-up generator yard for a data center in the southeast quadrant of San Francisco that involved detailed analysis under CEQA. Obtained approvals for a local, well-known grocery store to open a new location in San Francisco’s northeast Mission neighborhood. Gregg also handled the lease negotiations for the site. Obtained entitlements for the expansion of the San Francisco Columbarium, a designated San Francisco landmark, including approvals from the then newly-formed San Francisco Historic Preservation Commission. Obtained approvals for the creation of a special use district in order to relax density restrictions and certain other code requirements applicable to a residential development in San Francisco. Entitled a 250-foot tall, high-rise residential project in San Francisco’s Rincon Hill area. Represented the buyer in the acquisition of a multi-building campus in the metro area of Boston, Massachusetts. Represented the buyer in the acquisition of an approximately 335,000 sq.ft. office building in Manhattan, New York, and also represented the seller in the subsequent sale of the building. Represented the seller in a portfolio sale of three office buildings in the metro area of Seattle, Washington. Represented the buyer in the acquisition, via a joint venture, of a 1.2 million sq. ft. office campus in the Dallas/Fort Worth, Texas corridor. Advised several institutional lenders on various loan workouts, including a receiver’s sale, with an aggregate value in excess of $300 million. Represented the lender in a $60 million mortgage loan secured by a ground leasehold interest. Represented the developer/borrower in a $150 million construction loan for a state-of-the-art biotechnology building. Represents one of the largest owners of light industrial and distribution centers on the West Coast and completes several million square feet of leases annually for such space. Represented the tenant in its headquarters lease of approximately 110,000 sq.ft. in one of San Francisco’s premier office towers. Represented a major San Francisco retailer in the renewal of its flagship store lease in Union Square. Represented a solar panel manufacturing company in the lease of its 225,000 square foot manufacturing headquarters. Represented the sublandlord in the sublease of approximately 130,000 sq. ft. of office and research space in Stanford University’s Research Park. Represented the tenant in a distribution center build-to-suit lease for 700,000 sq. ft. of space and a sublease of an approximately 750,000 sq. ft. distribution center. Gregg has been a recommended lawyer in Legal 500 USA in the Land Use/Zoning category.